This neck pillow is a quick and easy make. 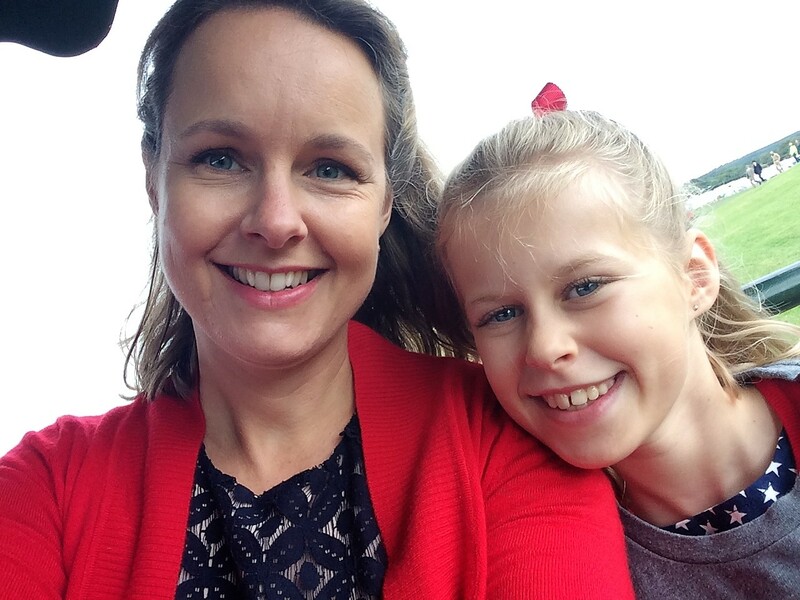 Pugs are my daughter’s favourite dog breed and I have to agree – they can be pretty cute. She also loves plush fabric, so I chose a nice soft cream plush for Pugly. The felt features are just cut out and sewn on by machine. 40 cm x 80 cm (15 1/2″ x 31 1/2″) cream or beige plush/ minky/ cuddle type fabric. I am lucky to live near the Eternal Maker – basically a warehouse full of gorgeous fabric. 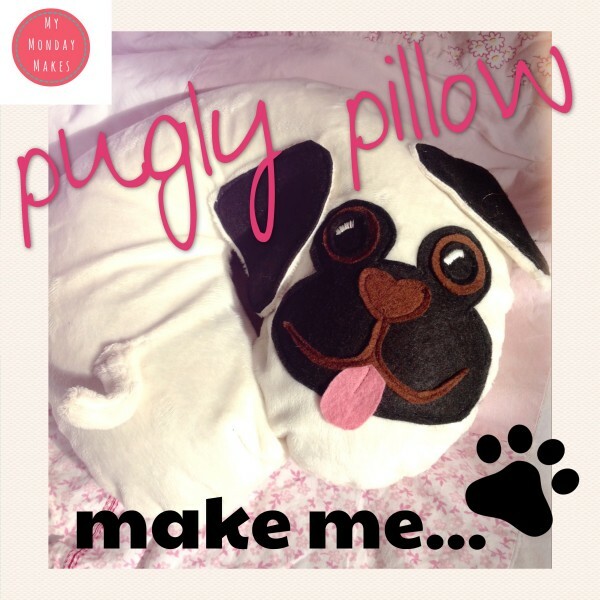 You can order on-line if you don’t have a local plush supplier. Plush Addict is another good source of cuddly soft fabric. Body: If you’re covering a pillow, use this to make a template, making sure you allow extra for seams. If making from scratch, draw a ‘c’ shape, about 20 cm round the body with rounded ends. The finished dog measures about 40 cm x 30 cm. Do this twice. Cut out your body shapes and set aside. Pink felt = 1 x cheeky tongue! 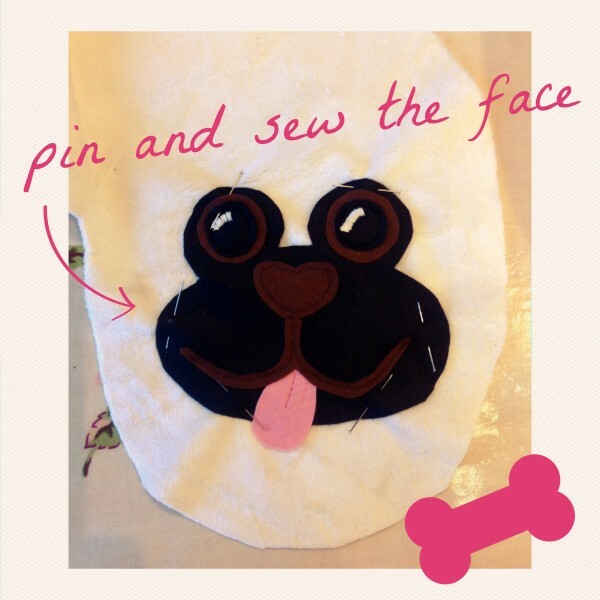 Nose, mouth and tongue: Position the nose, mouth and tongue pieces on top of the face and sew using a brown thread – making sure the tongue is tucked under the middle section of the mouth. Using pink thread, sew a small line in the middle of the tongue, stopping half way down. Now all the features are sewn, pin the face to the right side of one beige plush body piece, then sew round the edge to secure. 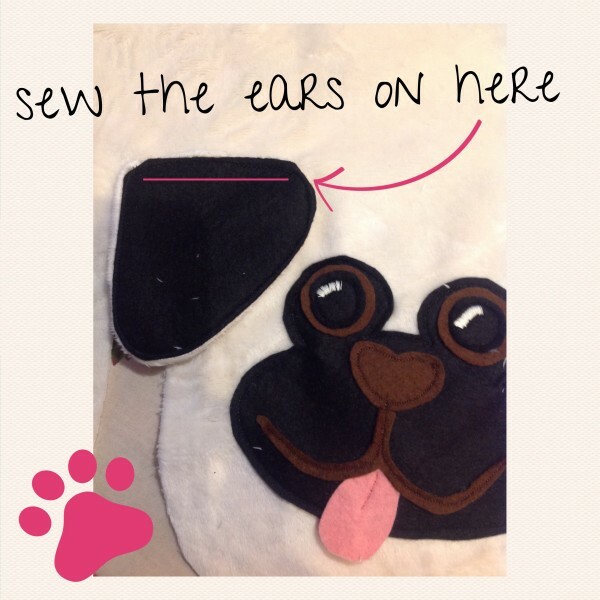 Place the black felt ear piece on top of the right side of the beige plush ear, pin then sew round, leaving a 5 cm (2″) gap at the top of the ear (see picture below). Turn right side out. Fold the unfinished edge in and pin to the body as shown below. Top-stitch the ears to the body (black side up) closing the gap. Make sure that you leave your seam allowance free on the body piece. 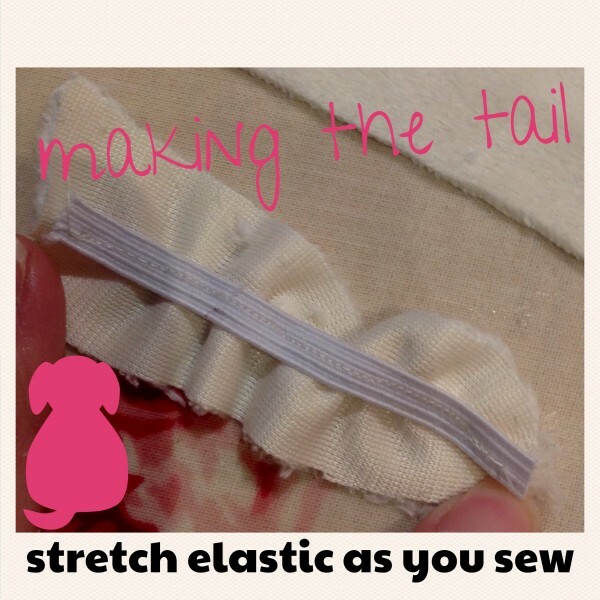 Sew the elastic to the wrong side of a tail piece – stretch the elastic as you sew. This will make the tail curl when you let go. Place the tail pieces wrong sides together and sew round, leaving gap at the top where it will be attached to the body. Turn right side out, tuck in unfinished edges and top-stitch to the ‘tail’ end of the dog’s body. Now all the features are complete, place the back and front body pieces together, right sides in. 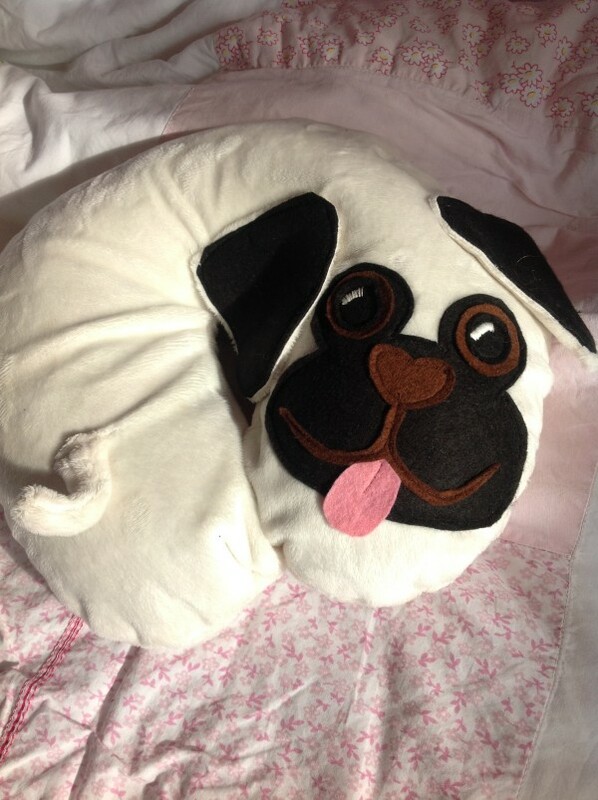 Pin and sew round, leaving a gap on the dog’s back big enough to stuff or fit your pillow in. Make sure the ears are safely tucked in so they don’t get caught as you sew. Turn right side out and stuff or tuck your pillow in. Hand stitch the opening closed, using a ladder stitch. 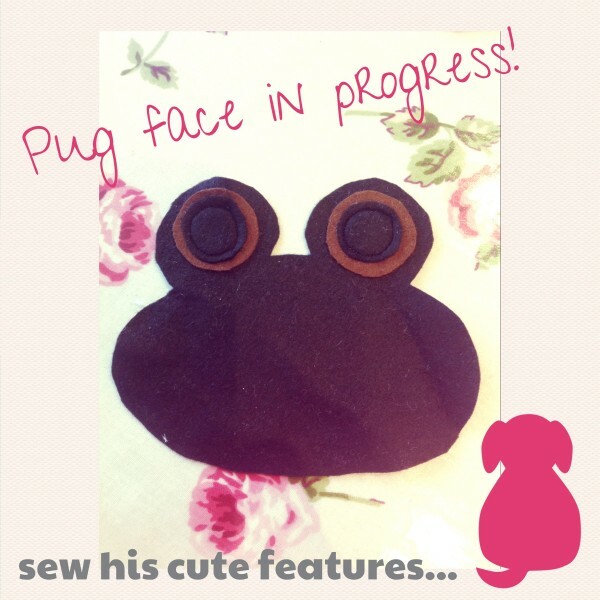 Your very own Pugly is now finished!